To my somewhat bemused amazement, her ears dropped, she looked directly at me for a second, as if seeking confirmation of my meaning, and then turned and walked a few feet away, turned around and laid down. I had never taught her that command. I’d love to know if Prudence had been with Phil for her entire life, or if she could have learned this command prior to meeting Phil. 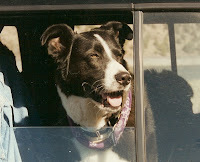 I’m wondering because I remember the day I brought home my dear Jake from Multnomah Co. Animal Shelter, back in 1995. All my dogs had always enjoyed the front seat in my car, so on the day we left the shelter I opened the passenger door for Jake and in he jumped…and kept on jumping, over the center console, and into the back seat. During our many years together, Jake would ONLY ride in the back seat. Clearly he had learned this before he came to me. I figured he would eventually make his way up front, after which he and I could have meaningful conversations without my having to turn my head and speak to the back seat. But this would never be. The thought just occurred to me – maybe he didn’t like my driving skills, and this was a self-preservation tactic. In which case, dear Jake, I completely forgive you. Chris, I didn’t notice this posting until today, but let me answer your question; I had Prudence for her entire life, after I found her running down a lonely country road late one night back in 1985. She was approximately 8-10 weeks old at the time, and from that day she seemed to learn how to merge with my life by some sort of osmosis – with many of her understandings of my wishes coming almost as if by magic, rather than strict training. I honestly believe that dogs, or some dogs anyway, develop an ability to understand far more words than we give them credit for, particularly dogs that seem to look directly into your soul. It is a unique bond when that happens, and isn’t something you can just make happen, unfortunately. She was one of a kind, as were Martha and Jake. 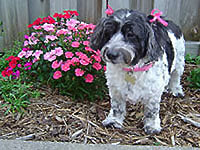 Thank you for your work on behalf of the animals, and those of us who have lost dear pet companions.